16 oz. 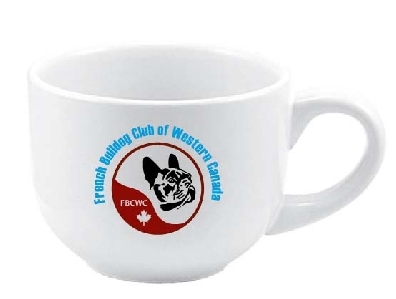 soup or coffee mugs, great for your morning oatmeal or your evening tea when you curl up with your Frenchie companions in front of the fire or your favourite TV show. The mugs, diswasher and microwave safe, are $12, plus shipping and handling. All funds go directly to FBCWC. Enter your name, email, address and phone #, and we will contact you ASAP for delivery and payment options.